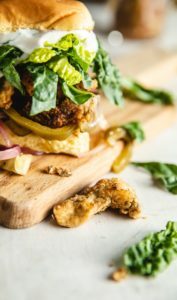 This April Fool’s Day, we have the perfect trick for your carnivorous friends: a Southern-style fried chick’n sandwich that will give you a new appreciation for the meatiness of the humble oyster mushroom. This delicious prank is guaranteed to both shock your friends and satisfy cravings for a crispy plant-based version of an American favorite. Trim 1 inch from the bottom of the oyster mushrooms, and use your hands to tear the mushrooms into large pieces. In a large bowl, whisk the yogurt, ½ cup water, and ½ tsp salt until well combined. Add the mushrooms to the yogurt marinade. Line a baking sheet with a wire rack or paper towels. In a large bowl, whisk together the flour, cornstarch, garlic powder, onion powder, paprika, cayenne, and ½ tsp salt. Place a large nonstick or cast iron skillet over medium heat with enough vegetable oil to come halfway up the sides. While the oil heats to 350°F, dredge the mushrooms (shaking off any excess marinade) in the flour mixture. Shake off the excess flour and transfer to the prepared baking sheet. Add the mushrooms to the hot oil (they should sizzle) and cook until golden brown, about 3 to 4 minutes, flipping halfway. Transfer the fried chick’n to the prepared baking sheet and immediately sprinkle with salt. 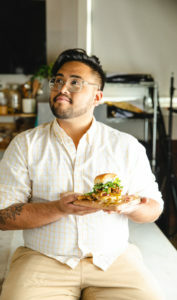 Serve with soft buns, vegan mayo, lettuce, or chowchow!